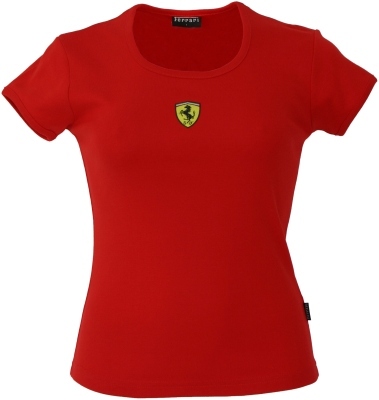 Red Ferrari Ladies Top with Ferrari Shield Logo Skinny Rib Shirt. Bound neck and sleeve skinny top in 100% cotton stretch 1x1 rib. Ferrari Racing shield badge to center chest, Ferrari print to back and Ferrari branded side seam label.